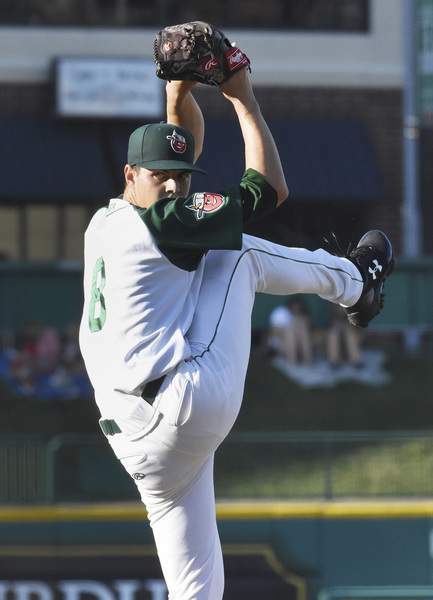 Rachel Von | The Journal Gazette The TinCaps' MacKenzie Gore struggled to stay on the mound with injuries, but he showed flashes of why he is the Padres' top pitching prospect. The TinCaps entered 2018 as one of the most talented teams in all of minor league baseball and they retained that distinction throughout the season. By the end of the season, 10 of the top-30 prospects in the San Diego Padres' top-ranked farm system had spent at least part of the season in Fort Wayne, as had a handful of other players who could eventually don Padres uniforms. Ultimately, the TinCaps fell one game short of reaching the playoffs, in part because many of those top prospects were on the disabled list by the end of the season. Still, manager Anthony Contreras, who guided the team for the third consecutive season, said he thought his young group made significant strides during the up-and-down campaign. There is a good chance some of those players who propelled the TinCaps to success this season will return next year, at least to begin the season. Here is a look at some of Fort Wayne's most important players from the 10th season at Parkview Field. Fort Wayne played host to a truly elite prospect for the second straight season, as Gore began the year as the top left-handed pitcher in the minor leagues. He didn't dominate the league like infielder Fernando Tatis Jr. did in 2017 and he was hampered by persistent issues with his pitching hand (first a blister and then a fingernail problem), but his prospect stock is undimmed after he struck out 74 in 601/3 innings and walked only 18. Patiño arrived in Fort Wayne in mid-May and pitched the way many thought Gore would. He was not on MLB.com's preseason top-30 prospects list for the Padres but zoomed all the way to No. 12 in September. The 18-year-old right-hander pitched 831/3 innings, more than double his previous career-high, and had walk and strikeout rates nearly identical to Gore's, with a 2.16 ERA for good measure. He also hit 99 mph with his fastball. Hernandez is not among the Padres' top-30 prospects yet but was arguably the TinCaps' most effective pitcher this season. His 1.81 ERA and 11 wins both led the league and he earned Midwest League Left-Handed Pitcher of the Year honors after giving up one run or fewer in 15 of his final 18 starts. Ruiz showed power at the plate – a team-leading 12 home runs – and good instincts on the bases – a league-leading 49 steals – but got on base at a middling .324 clip and struck out in nearly 29 percent of his plate appearances. He also struggled at second and will need to improve his defense or be moved to the outfield. Arias was one of the best defensive shortstops in the league all season, showing off a strong arm and solid range. His bat was a work-in-progress, but he exploded late in the season, hitting .288 and slugging .534 with four home runs after Aug. 1. Still just 18, Arias could be back in Fort Wayne next season. Key quote: “(Scout opinions) have been (more favorable) of late as Arias has gone from utilizing an open stance and simply striding closed to a monster leg kick that looks similar to the one used by (Yankees rookie) Gleyber Torres.” – Eric Longenhagen, prospect analyst, writing for Fangraphs in late August. Like Arias, Suwinski struggled at the plate most of the season, but something clicked in late July. The 20-year-old was one of the league's best hitters in August, hitting .368, getting on base at a .430 clip and driving in 28 runs in the final 33 games. He's played two seasons in Fort Wayne and could move up the minor-league ladder at the start of 2019.